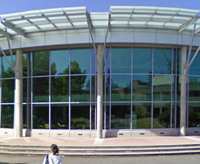 Welcome visitors and guests to your building by adding a glass canopy to your entrance. It's the perfect finishing touch! Enjoy natural sunlight while incorporating geometry and texture onto the surface of your home or building. As a maintenance free option to let in natural light, our custom ridged skylights are a beautiful and functional solution. With customized sloped glazing skylights, the creative and aesthetic possibilities for natural light are nearly endless. Soak up sunlight year-round in a beautiful, open sunroom for your home or business without breaking the bank. 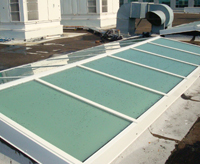 Having been in business since 1988, Custom Designed Skylights is a company respected for excellence in residential and commercial applications of skylights and sunrooms. Our products reflect a quality and creativity that few competitors can match. We take pride in every Sun System we create. Each system is designed to address environmental and aesthetic considerations. 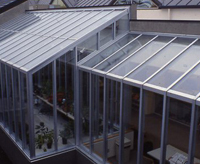 A custom designed skylight or sunroom will complement, enhance, and meet the needs of architects, designers, and homeowners. Commercial use of a sunroom or skylight on a restaurant, or any other business, adds a very cost effective additional lighted dining or living space while increasing the visibility and aesthetic appeal inside and out. Businesses report significant sales increases and find that their customers truly enjoy the bright and airy atmosphere. 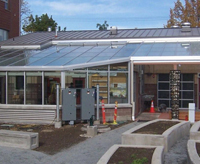 Custom designed Sun Systems are designed and engineered to withstand many years of exposure to the elements, all while providing the easy to care for convenience of aluminum. At CDS we pride ourselves on using state-of-the-art technology to allow you to enjoy seasonal changes throughout the year at reasonable prices with minimal maintenance. A Sun Space will add beauty and value to your home or business. 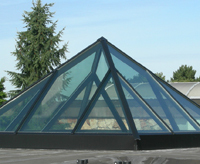 If you are an architect looking for a company that can design and build your skylight, or just a local business or home looking for a custom designed skylight or sunroom, call us today for a free no obligation quote.